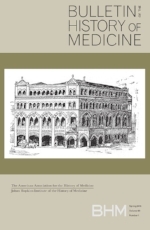 Contains three articles of the use of primary resources in the history of medicine. Open source issue on the Namesake (Vesalius) of the Journal of the ISHM. The organization is thriving but the magazine is defunct. This issue is archived on the OAH site and on jstor. "... as contributions to the intellectual history of medicine. Each shows, in its own way, how a particular disorder became conceptualized ..."